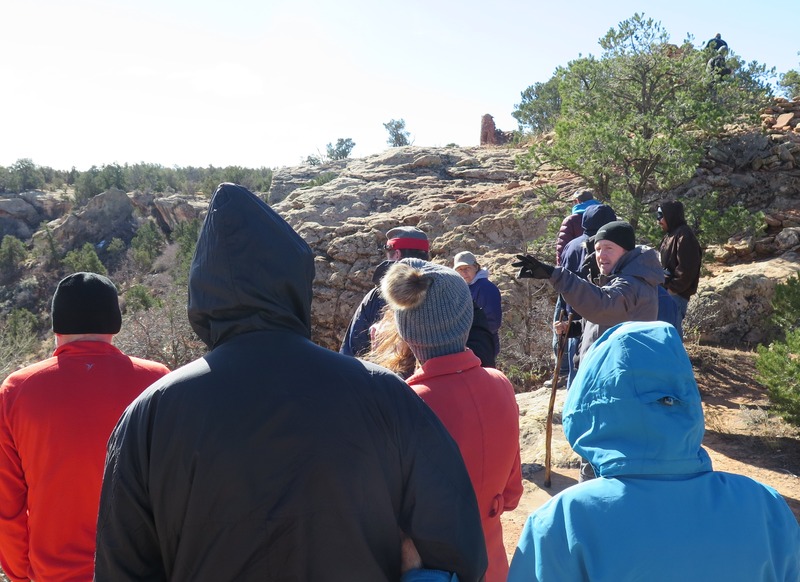 It’s been over a year now since I first contacted Four Corners Adventures in Blanding, asking about the possibility of doing a mini familiarization tour out on Cedar Mesa for our Monticello, Blanding, and Bluff Fort visitor center staff. We e-mailed back and forth several times going over details and prices, but unfortunately with a group as large as we were looking at (up to 20-25 people) the trip was just too expensive for my office to cover it, especially as late in the year as it was. But I always kept the idea in the back of my head hoping that somehow we’d be able to figure out a way to make it work. 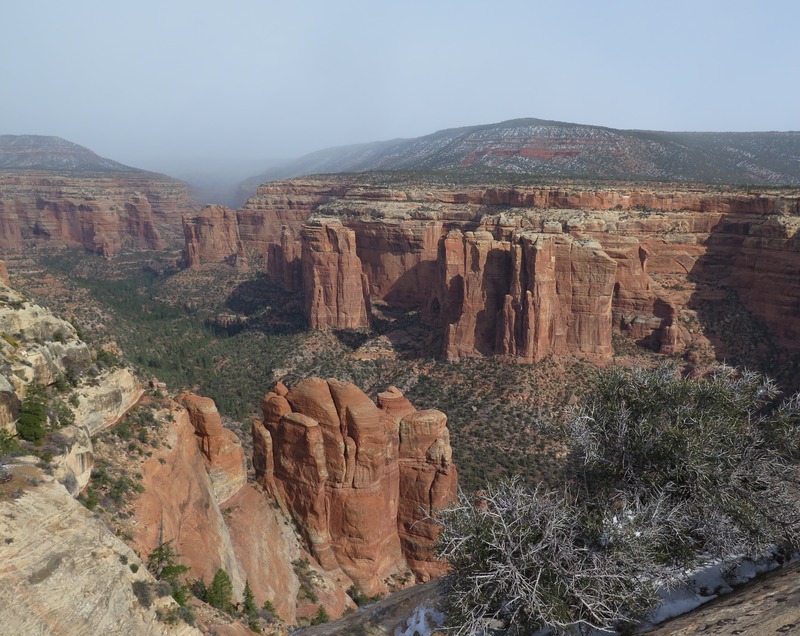 About 3 weeks ago Jared Berrett, the owner of Four Corners Adventures, e-mailed me saying that he had some free time coming up in his schedule and he offered to do a tour out to Arch Canyon Overlook & Cave Tower Ruins for our visitor center staff free of charge. I was ecstatic about his offer, and we spent the next week or so e-mailing back and forth figuring out the details & coordinating with our visitor center staff. Now I want to mention that we’ve been having a gorgeous, unseasonably warm fall. This is my 8th fall in Monticello and I don’t think we’ve ever made it to the week before Thanksgiving without snow before, but this year has been incredible. I was wearing sandals and T-shirts up until two days before the tour! BUT, as luck would have it, the forecast for the the day of our tour was snow. I kept thinking that it was possible that it wouldn’t actually hit us, but I’m pretty sure that deep down I actually knew that we were going to get snow, and it was just wishful thinking. I woke up the morning of the tour to a light drift snow on the ground, and by the time I left for work at 8:00am, it was snowing again and I couldn’t even see across the back parking lot from my office window. I put in a quick call to Four Corners Adventures’ store in Blanding to ask if the trip was still on. Dallin, their General Manager, answered and said that they had gotten a little bit of snow, but it didn’t sound nearly as bad as what we had (they’re almost 1,000 ft lower in elevation than Monticello) and they could actually see some patches of blue sky to the south, so the trip was still on! I told them the roads here were covered, so we might be a little late, but we’d be there and to not leave without us! My coworker and I picked up the two employees from the Monticello Visitor Center who were joining us on the tour, and slowly made our way down the snow-covered roads to Blanding. 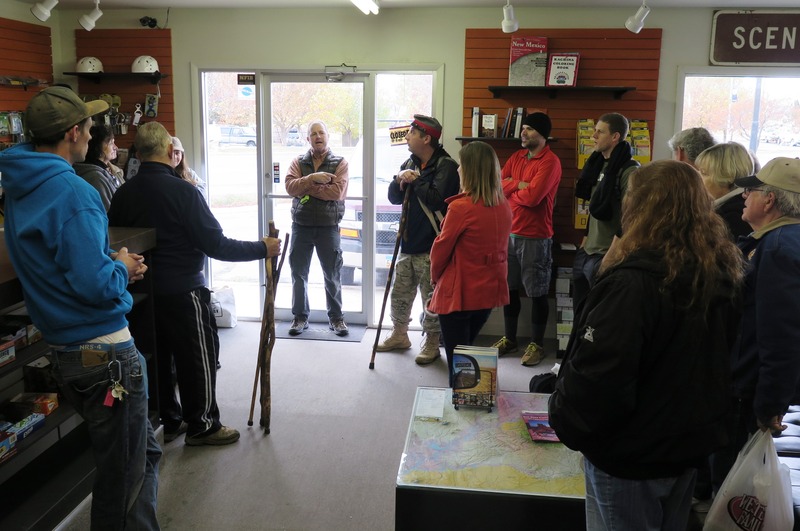 When we arrived at the Four Corners Adventures store right across from the Blanding Visitor Center, everyone else was already there and they were in the middle of going around the circle doing introductions. 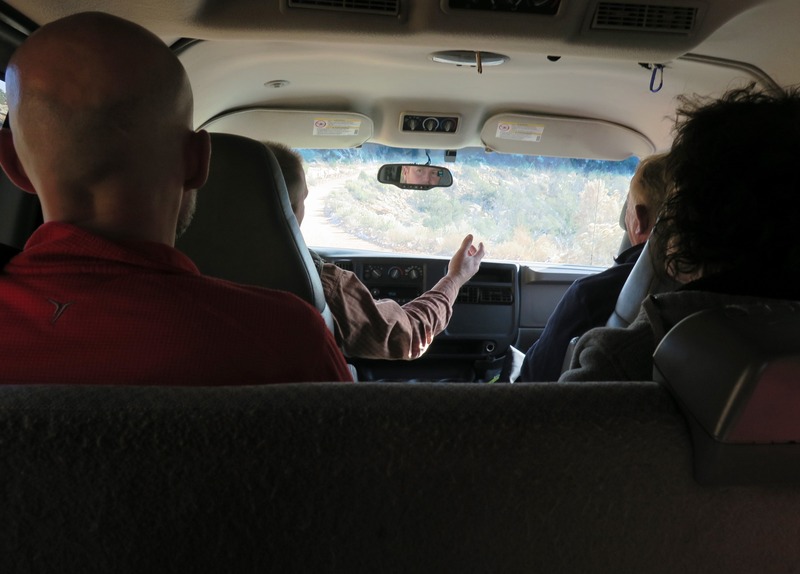 After everyone had introduced themselves we loaded up in their two vans, and hit the road. On the ride out I was in Jared’s van, and he gave us a lot of great interpretive information on the drive. We had 3 people from Utah.com who were able to join us on the tour, so I think it was especially informative for them since they’re not from the area. He gave a rough timeline of when the San Juan County area was inhabited by the Ancestral Puebloan people, (approx. 700-1300AD) and he pointed out ruins that were visible from the road and trailheads to popular ruins as we passed them. 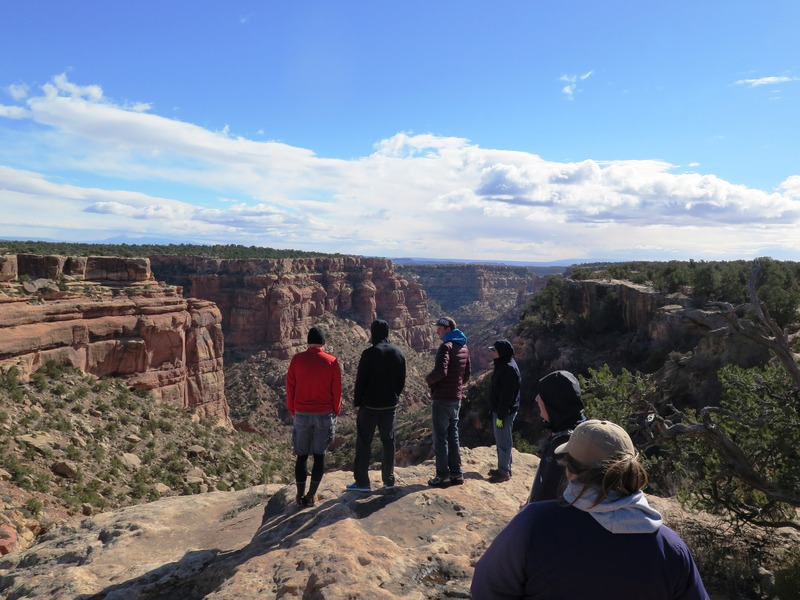 I always love getting to go out with our guides- after living in San Juan County for 7.5 years I’ve been to quite a few places in this area, but there’s still LOTS I haven’t seen. I think you could live here your whole life and never see it all, but I intend to put as much of a dent in it as I can, as long as I’m here! As much as I’ve seen on my own, going out with a guide is a whole different experience. For example, I’ve gone on guided trips to Monument Valley & Mystery Valley with Goulding’s, Rafting on the San Juan River with Wild Rivers Expeditions, canyoneering in Leprechaun Canyon with North Wash Outfitters, taken side-by-sides to River House Ruin & Butler Petroglyph Panel with Four Corners Adventures, and now, out to Arch Canyon Overlook & Cave Tower Ruins with Four Corners Adventures. Of the 5 trips I’ve been on with guides, I’d been to 4 of the locations with my husband previously, but I still learned SO much each time I went out with a guide. If you’re visiting a place for the first time and you’re with a guide, of course you’re going to learn a lot! But even when you’ve been there previously, when you go with someone else you get to hear them talk about it from their perspective and you always learn something new. Most importantly though in my mind, is getting to experience a trip led by one of our local guides, which is invaluable to any of us working in the tourism industry- we now have first-hand experience that we’re able to share with our visitors. You can hear about something your whole life and repeat that information to others, but nothing compares to getting to experience it for yourself first hand. I think the excitement of getting to share your own experience with others really resonates with them- they can feel your excitement and they become excited about it too- that’s why I think first hand experiences are priceless. The van ride went by really fast and before we knew it, we had pulled up to Arch Canyon Overlook and everyone piled out of the vehicles. It was snowing lightly and we could see another flurry working it’s way toward us from the south, so we knew that our time to take in the view and get photos might be limited. 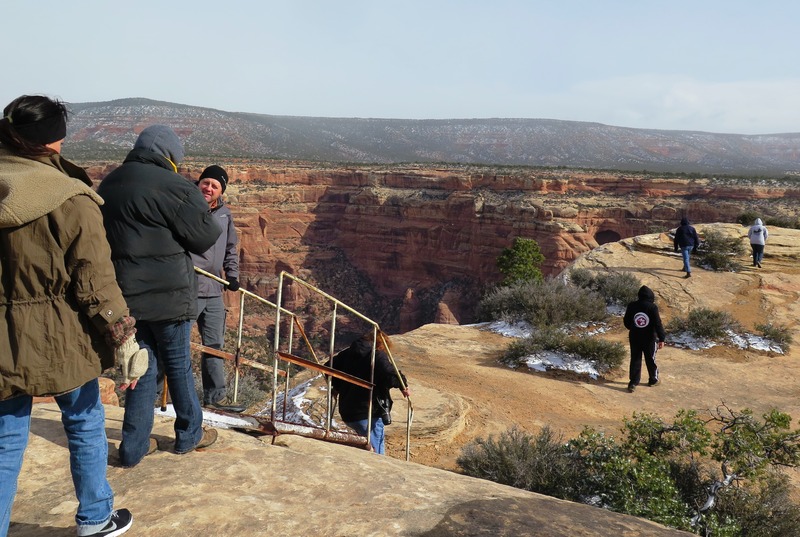 We all walked along the rim and then made our way out to the point via a narrow metal staircase/ramp. I’ve been out there one other time, and it’s only been a year since my visit, but I was still just as much in awe of the view as I was on my first visit. San Juan County is such an unbelievably beautiful place- even after 7.5 years the beauty of this place continues to blow my mind! 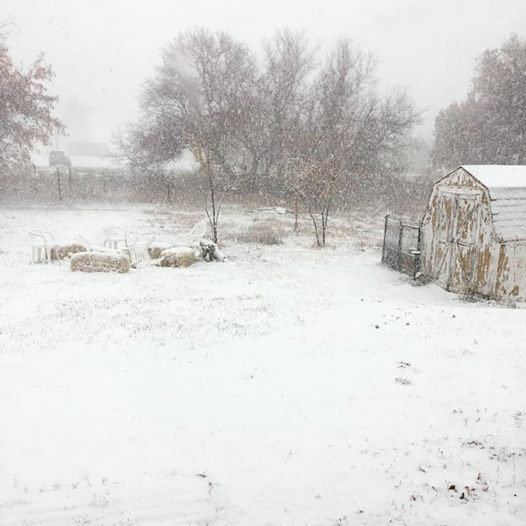 And although it was cold, windy, & snowy I was so excited to be out there to get to see it lightly blanketed with the first snow of the season! As I mentioned to some of the others on the tour- I never would have taken my own vehicle out there on a day like that, so it was definitely a treat to be out there in the snow! Before we headed back to the vans Jared took a group photo with everyone who was still out on the point. (I think the photo above is about 2/3 of our group) Glad he thought to take the photo- usually I’m very good about doing it, but I completely spaced it that day. Chalk one up for going with a guide! 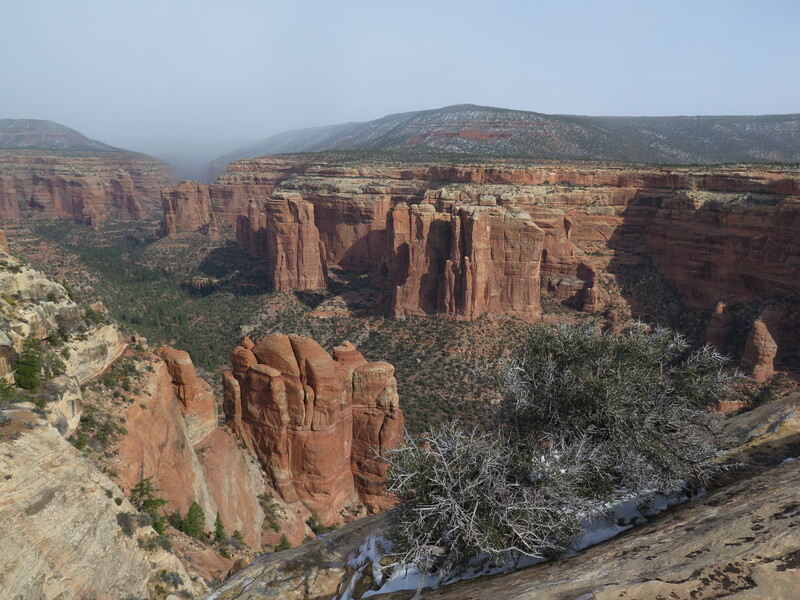 Our next stop was Cave Tower Ruins- pretty much across the highway from our turn for Arch Canyon Overlook. One really nice thing about Cave Tower Ruins (also called Seven Tower Ruins) is that it is one of the few easily accessible ruins that you can pretty much drive right up to and there really isn’t a hike involved. This is great for individuals with mobility issues who otherwise may not be able get out and see ruins like these. 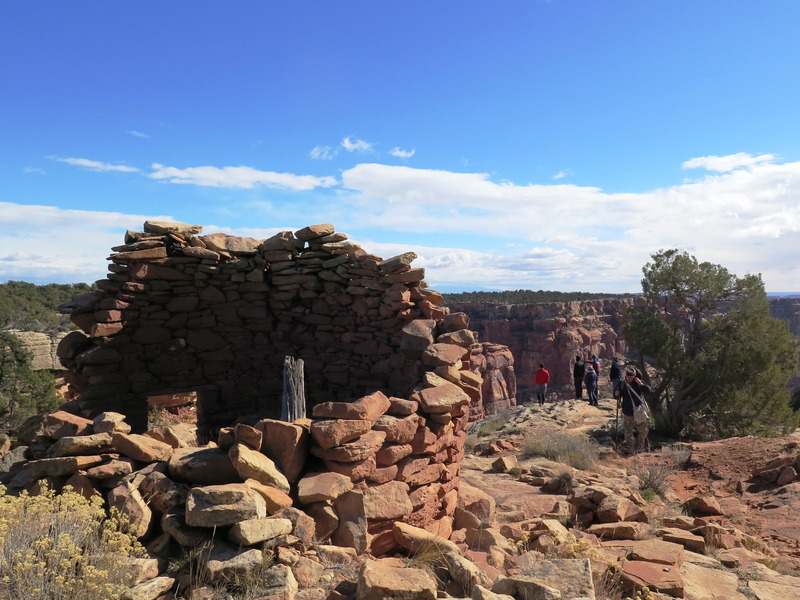 We all took our time walking along the rim, looking at the ruins, & taking photos. It was still really cold and windy, but it had really cleared up and turned in to a beautiful day to be out on Cedar Mesa! 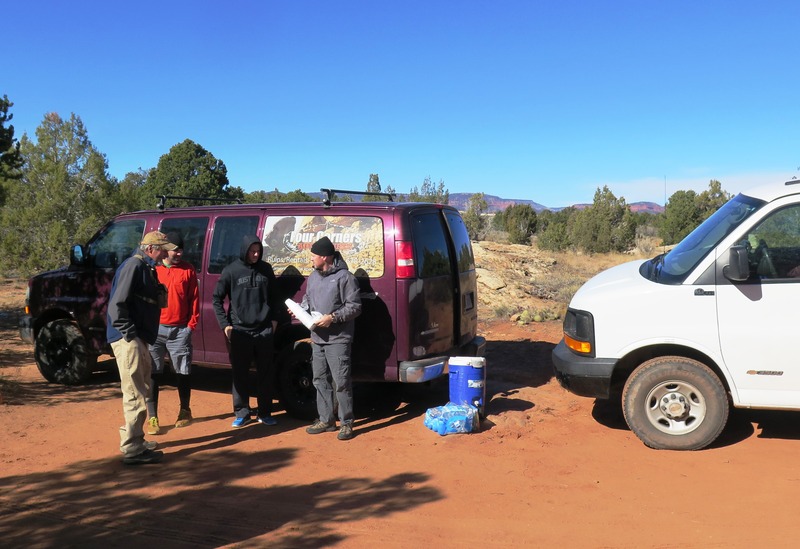 We all made our way back to the vehicles at our own pace, and when I walked up I could see that Dallin was moving one of the vans to make a wind-block for us, and Jared was getting a huge thermos of hot chocolate out of the back of the other van. What an unexpected treat it was to have hot chocolate to warm ourselves up with on such a cold & windy day! (Not to mention bottled water, granola bars & trail mix that were passed around as well!) Chalk another one up for the guides! These extra touches, like hot chocolate on the first snowy day of the year, are the things that turn a good trip into a great trip! I think everyone really appreciated the hot chocolate, and for 10 minutes or so we all forgot about the cold and the wind, and happily drank our hot chocolate, snacked on granola bars & trail mix, and stood around chatting and just enjoying being out there with each other. The day was over too soon- I would have happily stayed out there all day! But I’m really happy we were able to make it happen and that so many of our visitor center staff were able to come, and I’m extremely grateful to Jared for offering to take us all out. And more than anything, I’m thrilled that I now have the experience of going on a tour with Jared & Dallin and look forward to being able to share my experience with visitors who are planning their trips to our area! 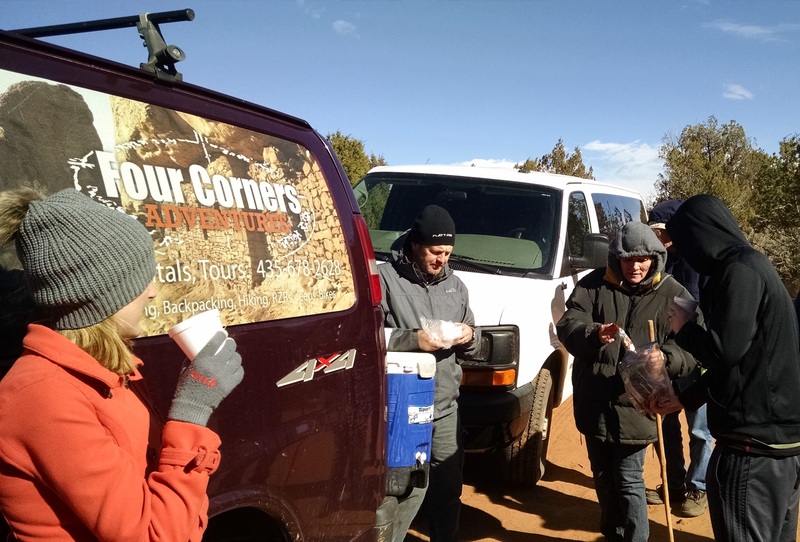 Four Corners Adventures provides a wide range of guide services including both land based tours, and guided river trips on the San Juan River. Their land based trips include Jeep, Hummer, Side-by-side, Mt. biking, Backpacking, & Canyoneering trips, and they also rent out jeeps & mt. bikes for people to take out on their own. Also, in addition to their guided river trips, they rent rafts, canoes, kayaks, SUPs, and a wide variety of gear such as camp stoves, lanterns, water jugs, tents, sleeping bags, dry bags, etc.- pretty much anything you’ll need on the river aside from your own personal items. They also run vehicle shuttles and pick-ups for rafters on private river trips, AND, as if that wasn’t enough, if you’re looking for a place to stay while you’re in the area, they’ve got you covered with their 2 bedroom rental- The Loft. As always, I want to remind readers to please be respectful when visiting our archaeological sites. Please refrain from touching or entering ruins, if hiking with your dog, please don’t let it enter ruins, and please leave any artifacts you may come across where they are. Something as simple as picking up a pottery sherd and moving it, takes that artifact out of context and archaeologists are no longer able to get the information from it that they would have been able to, had it been left in place. 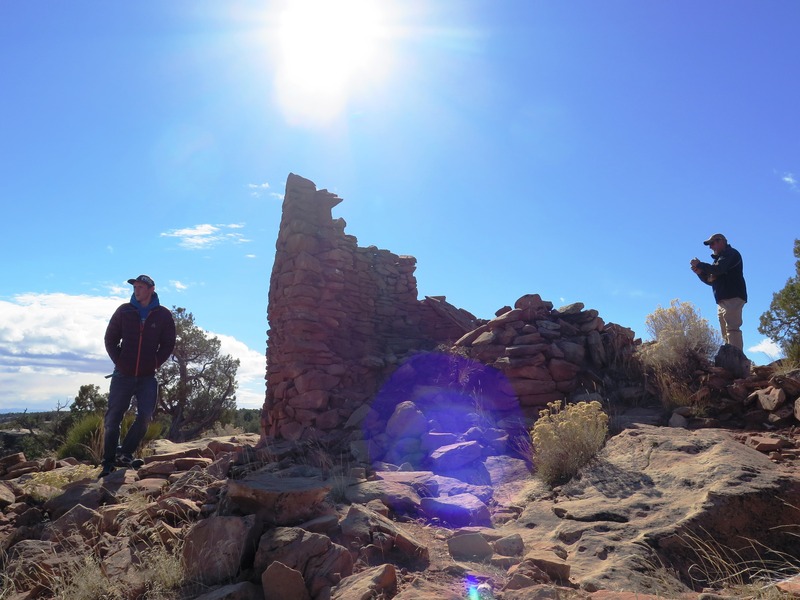 This entry was posted in Blanding, Cedar Mesa, Hiking, Off the Beaten Path, Ruins, Things to do for FREE!, Things to do with kids, Tours, Tours/Guided Trips, Travel, Utah, Visitor Centers and tagged Blanding, Cedar Mesa, Day Hikes, Hwy 95, Lodging, Off the Beaten Path, Ruins, Things to do for FREE!, Things to do with kids, Tours, Travel, Utah, Visitor Centers. Bookmark the permalink. 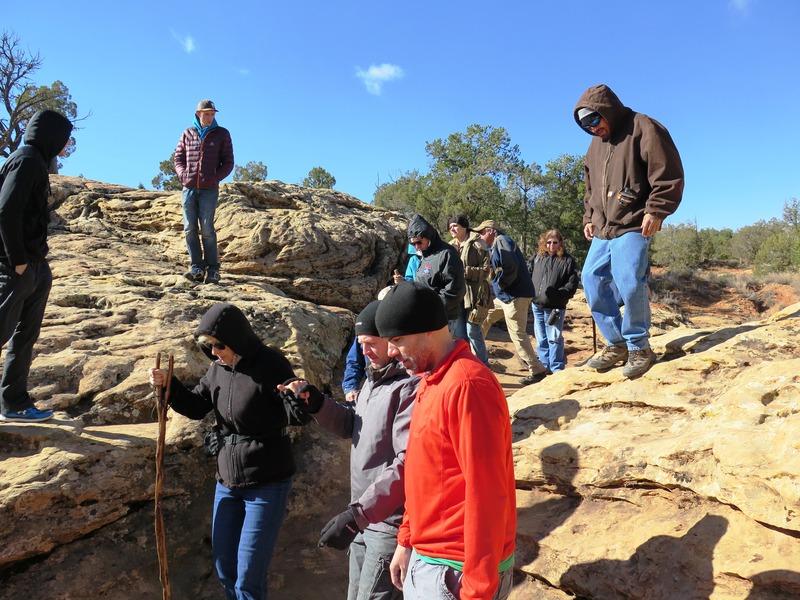 It was great to take the group out to such an unexpectedly beautiful and frigid day on Cedar Mesa. We absolutely love guiding in the Four Corners Region and feel so blessed to live in this wonderful country.